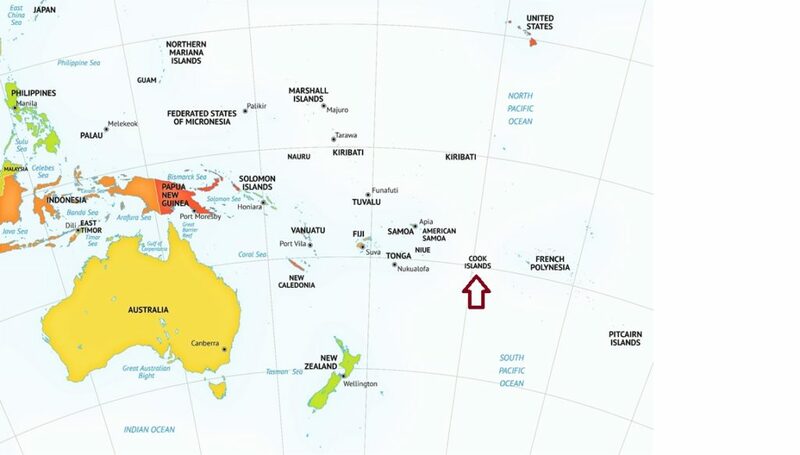 The Cook Islands are located in the Pacific Ocean from 156 to 167° W and 3 to 23° S. The total land area is only 91.4 square miles with a coastline of the 74 miles, but their exclusive economic zone, the territorial waters, stretches for nearly 772,395 square miles. With fifteen islands occupying less than a hundred square miles in land area, dotted over almost 700,000 square miles of ocean, the Cook Islands are among the most widespread island territories in the world. 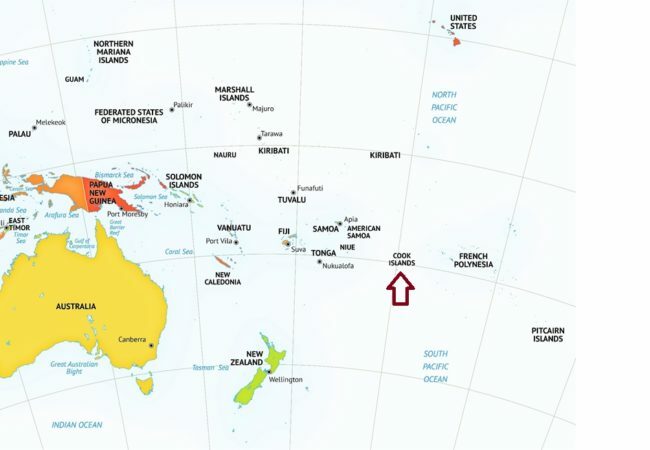 The Cook Islands are geographically divided into North and South groups. The 7 northern islands are mostly low-lying coral atolls. The southern group, with Rarotonga as its capital, consists of 8 elevated islands, is volcanic in origin and where the majority of the population lives. The Cook Islands is an independent state in an associated-state relationship with New Zealand. It has its own parliament and government and its own laws and judiciary. The Cook Islands benefits from an extensive marine and ocean jurisdiction with an Exclusive Economic Zone (EEZ). To the Cook Islands the ocean is central to life and is valued for many reasons, including transport, fishing, recreation, tourism and its spiritual and cultural significance. It is also rich in resources, specifically seabed mineral deposits such as polymetallic nodules, polymetallic sulphides and cobalt rich crusts. The Cook Islands actively encourages the development of these mineral resources and are the first nation to promulgate legislation specifically covering subsea mining by establishing the Mineral Seabed Authority and enacting the Seabed Mineral Act of 2009. On 13 July 2017, the Cook Islands parliament formally established its Marae Moana – one of the biggest marine reserve areas in the world, an area similar in size to the landmass of Mexico – now officially designated as the Cook Islands Marine Park. OML supports the development of the marine park. All OML exploration activities are outside any exclusion zones and OML will work closely with the Cook Islands to ensure seafloor mineral development is done sustainably.